I just got a replacement pair of binoculars for my old Zeiss “Diafun’s” and I went to my stack of unread or un-acted-upon items that seems to permanently decorate my desk. There I found a copy of the Cornell Ornithology Lab’s Fall 2013 article on the birding binocular evaluation that Steven Zax generously handed me in November. Cornell doesn’t go through the process of evaluating binos very often. The last bank of test was five years earlier, and as pointed out in the article, there have been many changes in equipment and prices since 2008. So, if you are in the market to replace your current pair, or to know what you would get in case of a loss or accident, the articles are worth reading, and Cornell generously puts them on line for you at no fee. A few notes about their conclusions. 1. You can spend nearly $3,000 including sales tax for the best of the best nowadays. 2. Their basic advice (Jessie Barry and Ken Rosenberg are the authors of the main article) is to buy the best you can afford. I disagree, or put it differently. I would say the best you can afford to lose or break. 3. There are a lot of good binoculars available under $700 now. 4. There are no under-$100 binoculars that will satisfy a serious birder. You will find a whole lineup of links to the binocular review including the main article, Ken Rosenberg’s explanation of how to make a good buying decision, and the results of the evaluation in a table version. It turns out for me that the replacement for my Diafun’s is a pair of Zeiss “Terra ED’s”, slightly heavier, brighter, and amazingly sharp edge to edge. 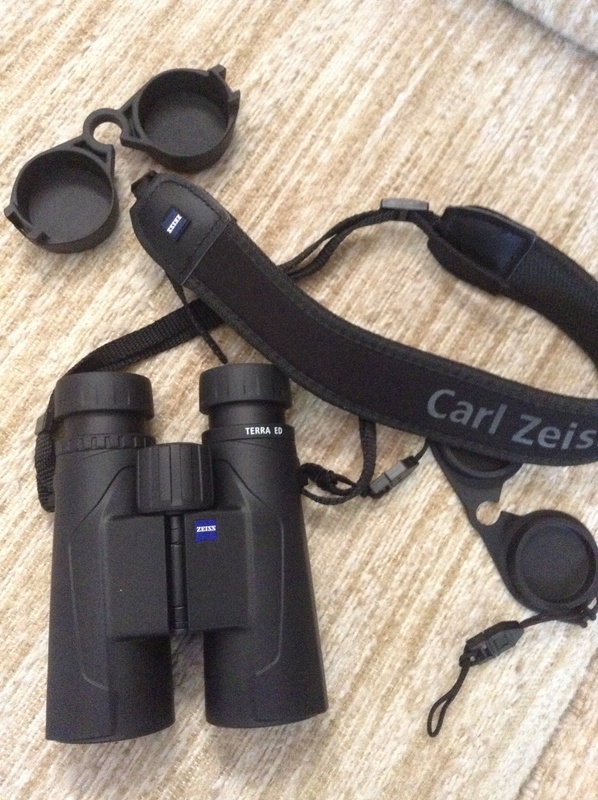 Question re the Zeiss – are you able to connect the eye cup protector to the strap and have it out of the way when you use the bins? and do youy strap the bins through the case? Dear Edna, I’m afraid I’m the wrong person to ask about the covers. I found the tie-on to the bottom covers great, and I left those attached fastened on one side of the straps, but I never leave the top (raindrop) covers on, on any of my bins. I leave those stuffed in my pocket if there are clouds, or in the car if the weather is clear.